[zd,pd,kd] = bilinear(z,p,k,fs) converts the s-domain transfer function in pole-zero form specified by z, p, k and sample rate fs to a discrete equivalent. [numd,dend] = bilinear(num,den,fs) converts the s-domain transfer function specified by numerator num and denominator den to a discrete equivalent. [Ad,Bd,Cd,Dd] = bilinear(A,B,C,D,fs) converts the continuous-time state-space system in matrices A, B, C, and D to a discrete-time system. [___] = bilinear(___,fp)uses parameter fp as "match" frequency to specify prewarping. 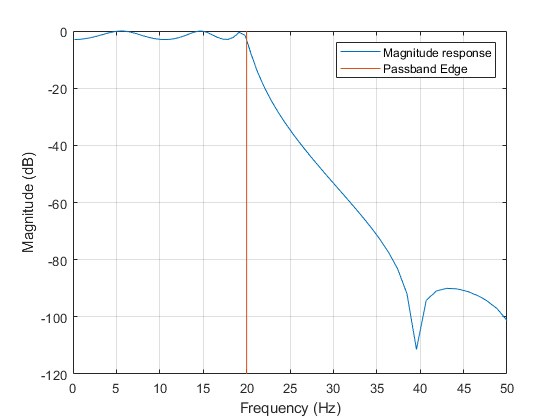 Design the prototype for a 10th-order Chebyshev type I bandpass filter with 3 dB of ripple in the passband. Convert it to state-space form. Create an analog filter with sample rate fs=2 kHz, prewarped band edges u1 and u2 in rad/s, bandwidth Bw=u2-u1 and center frequency Wo=u1u2 for use with lp2bp. Specify the passband edge frequencies as 100 Hz and 500 Hz. 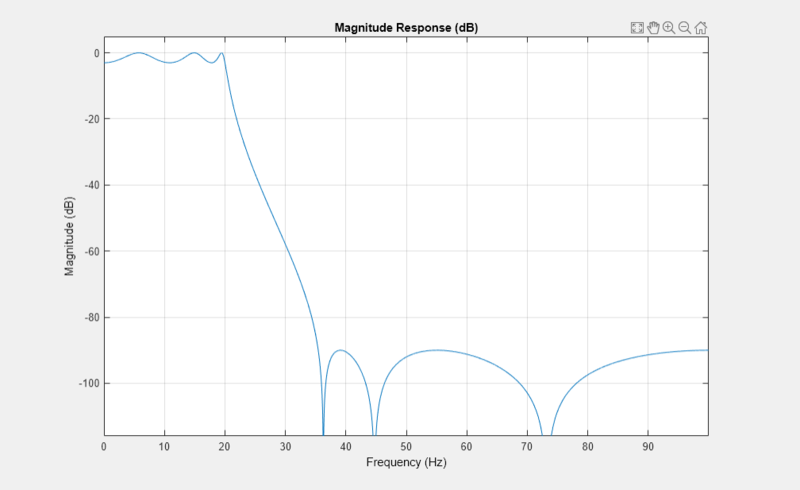 Calculate the frequency response of the analog filter using freqs. 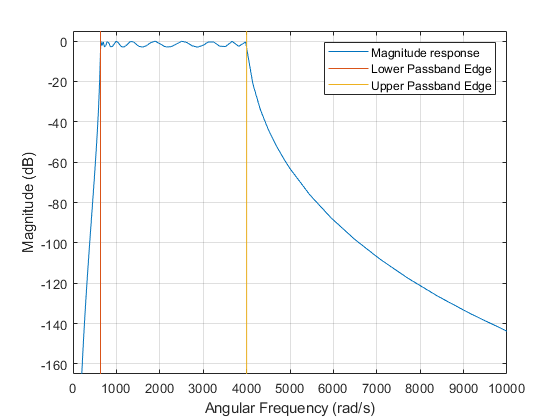 Plot the magnitude response and the prewarped frequency band edges. Use bilinear to create a digital bandpass filter with sample rate fs and lower band edge 100 Hz. Convert the digital filter from state-space form to transfer function form using ss2tf. 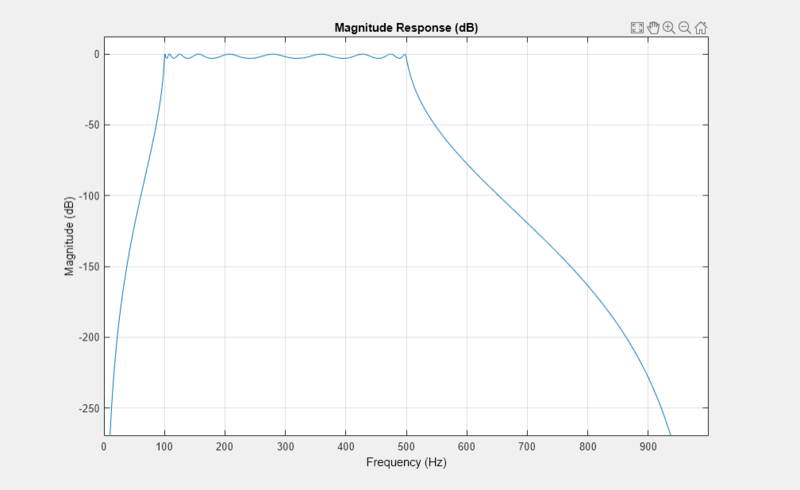 Use fvtool to plot the magnitude response of the digital filter. Design a 6th-order elliptic analog lowpass filter with 3 dB of ripple in the passband and a stopband 90 dB down. Set cutoff frequency fc=20 Hz and sample rate fs=200 Hz. Calculate the magnitude response of the analog elliptic filter. Visualize the analog filter. Use bilinear to transform it to a discrete-time IIR filter. Set the match frequency as fp=20 Hz. Visualize the filter using fvtool. Zeros of the s-domain transfer function, specified as a column vector. Poles of the s-domain transfer function, specified as a column vector. Gain of the s-domain transfer function, specified as a scalar. Sample rate, specified as a positive scalar. Numerator coefficients of the analog transfer function, specified as an array. Denominator coefficients of the analog transfer function, specified as an array. State matrix in the s-domain, specified as a matrix. If the system has p inputs and q outputs and is described by n state variables, then A is n-by-n.
Input-to-state matrix in the s-domain, specified as a matrix. If the system has p inputs and q outputs and is described by n state variables, then B is n-by-p.
State-to-output matrix in the s-domain, specified as a matrix. If the system has p inputs and q outputs and is described by n state variables, then C is q-by-n.
Feedthrough matrix in the s-domain, specified as a matrix. If the system has p inputs and q outputs and is described by n state variables, then D is q-by-p. Match frequency, specified as a positive scalar. Zeros of the z-domain transfer function, specified as a column vector. Poles of the z-domain transfer function, specified as a column vector. Gain of the z-domain transfer function, specified as a scalar. Numerator coefficients of the digital transfer function, specified as an array. Denominator coefficients of the digital transfer function, specified as an array. State matrix in the z-domain, returned as a matrix. If the system is described by n state variables, then Ad is n-by-n.
Input-to-state matrix in the z-domain, returned as a matrix. If the system is described by n state variables, then Bd is n-by-1. State-to-output matrix in the z-domain, returned as a matrix. If the system has q outputs and is described by n state variables, then Cd is q-by-n.
Feedthrough matrix in the z-domain, returned as a matrix. If the system has q outputs, then Dd is q-by-1. Numerator cannot be higher order than denominator. First two arguments must have the same orientation. The bilinear transformation is a mathematical mapping of variables. In digital filtering, it is a standard method of mapping the s or analog plane into the z or digital plane. It transforms analog filters, designed using classical filter design techniques, into their discrete equivalents. In prewarped mode, bilinear matches the frequency 2πfp (in radians per second) in the s-plane to the normalized frequency 2πfp/fs (in radians per second) in the z-plane. The bilinear function works with three different linear system representations: zero-pole-gain, transfer function, and state-space form. bilinear uses one of two algorithms depending on the format of the input linear system you supply. One algorithm works on the zero-pole-gain format and the other on the state-space format. For transfer function representations, bilinear converts to state-space form, performs the transformation, and converts the resulting state-space system back to transfer function form. It adds extra zeros at -1 so the resulting system has equivalent numerator and denominator order. If fp is not present, let λ=fs. fs is the sample rate in hertz. bilinear returns the discrete equivalent in row vectors numd and dend in descending powers of z (ascending powers of z–1). fp is the optional match frequency, in hertz, for prewarping. Parks, Thomas W., and C. Sidney Burrus. Digital Filter Design. New York: John Wiley & Sons, 1987, pp. 209–213. Oppenheim, Alan V., Ronald W. Schafer, and John R. Buck. Discrete-Time Signal Processing. Upper Saddle River, NJ: Prentice Hall, 1999, pp. 450–454.